“We have been the recipients of the choicest bounties of Heaven; we have been preserved these many years in peace and prosperity; we have grown in numbers, wealth, and power as no other nation has ever grown. But we have forgotten God. We have forgotten the gracious hand which preserved us in peace and multiplied and enriched and strengthened us, and we have vainly imagined, in the deceitfulness of our hearts, that all these blessings were produced by some superior wisdom and virtue of our own. Intoxicated with unbroken success, we have become too self-sufficient to feel the necessity of redeeming and preserving grace, too proud to pray to the God that made us.” [Abraham Lincoln,”Proclamation 97 – Appointing a Day of National Humiliation, Fasting, and Prayer”, March 30, 1863]. Today, can you imagine a modern president calling the nation to fast and pray like this? (Maybe with President Trump) The man whose face is on billions of pennies and five-dollar bills told a nation to return to God with repentance and humility. We could do a lot worse than take that advice again. President Lincoln’s proclamation is as relevant today as it was in 1863. If we don’t changes things, to put it in intellectual terms…we’re toast. So what are those of us who cherish traditional American values going to do about the liberal atheists nonsense that is going on around us? Whatever we do it’s probably nothing that the White House can do by itself. If we don’t do something we could find this nation…’ship of state…drifting further and further from God’s will. If each of us responds rightly we can avoid the ‘shoal waters’. Story time! Remember the five Houston pastors who nearly got thrown in jail because they refused to comply with the mayor’s subpoena? They had been ordered to provide the mayor copies of their sermons before they were presented from the pulpit. [Billy Hallowell,”Houston Gov’t Subpoenaed Pastors’ Sermons. Now They’re fighting Back”, TheBlaze, Inc., August 3, 2015]. How could a conservative town like Houston elect a mayor who was so liberal? In that part of the country just about everyone is a Baptist. Even the Methodists are Baptists. As it turns out most of the city’s churchgoing crowd never bothered to show up on Election Day. They stayed home like the vast majority of the city’s registered voters. [James C. McKinley Jr.,”Houston is the Largest City to Elect Openly Gay Mayor”, The New York Times Company, December 12, 2009]. That decision by voters to not show up and vote nearly got five pastors thrown into jail. Were these pastors who almost went to jail over their sermons also guilty of failure to emphasize the importance of politics and voting from their pulpits? As President Ronald Reagan famously said “freedom is just one generation away from extinction”. [Ronald Reagan,”Inaugural Address: January 5, 1967″, Ronald Reagan Presidential Library and Museum, December 17, 2016]. If voters had not shown up for our last presidential election we could very well be on the path of continued transformation of America. American citizens are slowly but surely realizing that they have been led down a path to doom and the silence is ending. Voices are being raised in every sector of society and they’re saying, “Enough!”. The transformation was not making us great; it was killing us. There is a story from Brandon, Mississippi. The high school marching band had been pulled off the field. School leaders…if you want to call them that…feared that one of the songs might have violated a federal court order. The song was, “How Great Thou Art”. That Friday night at the end of the second quarter fans sat quietly in the stands as the football teams trotted off the field. Suddenly a lone voice began humming a familiar tune. Others joined in…moms and dads, cheerleaders, electricians, hairdressers, etc. The melody rose from below the press box until it became a mighty choir of hundreds who rose up in defiance, belting out the ‘forbidden’ song: “Then sings my soul, my Savior God, to Thee!”. 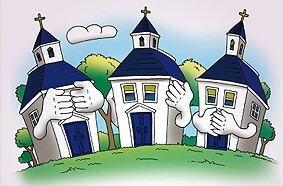 They… the Church (capital “C”)…took a stand for religious liberty that humid night in the great state of Mississippi. A quote that is often attributed to the Christian theologian and Nazi martyr, Dietrich Bonhoeffer, describes just what silence is: “Silence in the face of evil is itself evil; God will not hold us guiltless. Not to speak is to speak. Not to act is to act.” God’s people can no longer go silently where the secular evil would lead. Our duty is to be civil…not silent. Making America great again doesn’t start in the White House; it starts in our living rooms, our kitchens, our yards. It also should be reinforced in our churches. Where is your church when it comes to making America great again? The answer is in your ‘court’. Next week we will look at times when the church wasn’t always fearful of offending. If God’s guidance for us can’t be promulgated from the pulpit, then where?